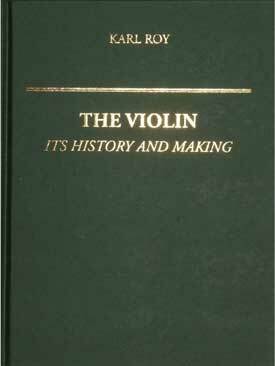 This hardback book contains nearly 800 pages of information of interest to beginners, learners and lovers of the violin and violinmaking. The intent is to explain the most important details of classical violinmaking from selection of wood, through varnishing, instrument set up, and the changes that occurred in the instruments and craft over the centuries. It is lavishly illustrated with both Karl Roy’s illustrations and images from museums throughout the world and comes in a slipcase. The history of bows and bowing is also examined in great depth with an understanding of the role of the bow. The text thoroughly discusses the preparation and application of violin varnish. An extensive glossary describes the many resins, gums, and solvents that have been used for varnish. Many recipes for spirit, fatty oil and etheric oil varnishes are included.